Are you looking to get rid of that drab and dreary tiling in your bathroom? If you have answered, contact Stile IT today for bathroom tiling Hampshire that is out of this world. Whatever your preferences our skilled tilers will deliver affordable results that will transform your bathroom space. 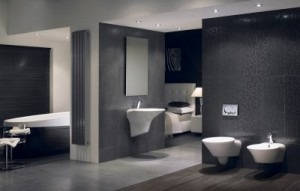 At Stile IT, we pride ourselves on being the very best Hampshire bathroom tiling specialists. We provide a complete tiling package that is available to both domestic and commercial customers. Your bathroom should symbolise luxury, an escape from the everyday world. But nothing spoils the experience more than tiling that is either damaged or seriously dated. Fortunately, with our fantastic bathroom tiling in Hampshire, you can again rediscover just what makes your bathroom so unique. Our design service is completely bespoke with tailored solutions for both wall and floor tiling. When you call us up, we will sit you down with our brochure and some free samples. The friendly advisors at Stile IT really know their stuff and can carefully advise you on the best colour schemes and designs to complement your room. As soon as you are happy with your chosen Hampshire bathroom tiling, we will supply you with a free no-obligation quote. Your tiles will be carefully fitted by our skilled professionals who will seek to do so while minimising any disruption to your daily routine. Because we source our tiles from a variety of sources, we can guarantee you the widest selection and the very best quality. We pay every job the same level of professionalism and with our on point attention to detail, you can be assured of a stunning finish every time. With more than 15 years of combined experience, our team knows just how to deliver bathroom tiling in Hampshire that is out of this world. Our trustworthy team have completed jobs for hundreds of satisfied customers and will always seek to treat your property with the utmost respect. Our Hampshire bathroom tiling services are designed to suit any and all budgets from standard options all the way up to high-end luxury solutions. We will always be upfront with you regarding the costs; there are no hidden charges and we will always seek your permission first should any extra work be required. So confident are we that we will provide you with the assurances of a full two year workmanship guarantee and a five year product guarantee. It is little wonder that so many of our clients have offered to provide glowing references upon request. For more inspiration, check out our gallery to see what we can do for you. Book your bathroom tiling Hampshire service today with Stile IT. Contact us on 02380 633966 or email us at info@stile-it.co.uk for more information.